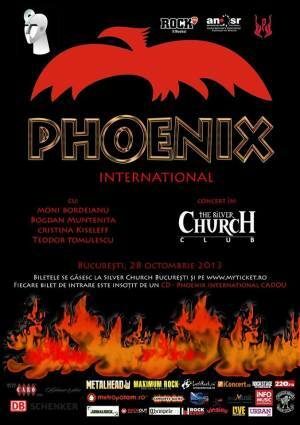 On October 28th, the legendary Romanian band PHOENIX returns to Bucharest in a unique concert in Silver Church Club! Event "Phoenix International" aims to bring to your attention a unique concept, with Romanian repertoire consists of the hits that the public ask every time, will be also presented so little known compositions, including pieces of Phoenix hits from the exile period in Germany. PHOENIX band offers a gift ("Phoenix International"CD ) for each ticket purchased. Tickets are available on www.myticket.ro and at the Silver Church Club in Bucharest. The ticket price is 45 lei (online) and 60 lei (for the purchase at the club). "PHOENIX live! @ Silver Church" Concert in Bucharest. You can get here description, reviews, address, time and details of "PHOENIX live! @ Silver Church" Concert in Bucharest. Visit Bucharest Tips for more Concert events in Bucharest!